Brett’s Summary: Guest Daniel Stowell, director of the Papers of Abraham Lincoln Project, started out as a religious/Southern historian with his early life and college experiences happening in Georgia and Florida. The Lincoln Legal Papers, now Series I of The Papers of Abraham Lincoln Project, started in 1985 to “finish” the collected works of Abraham Lincoln. A DVD-ROM was released in 2000 and a four volume selected edition of Lincoln’s Legal Papers was published in 2008. Literally thousands (96,000+) of Lincoln legal documents, documentation of cases he and his partners worked, are available. 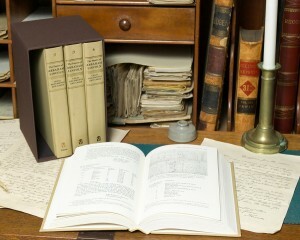 The documents were found using a variety of methods. “Blind searches” were simply going into Central Illinois courthouses looking at all court cases from the period Lincoln practiced law. In other counties, more focused searches were used which were looking for certain cases. Other sources included repositories around the nation and private collections. The papers tell us about Lincoln as a lawyer and also antebellum law in the Midwest. Stowell noted that Lincoln is the “poster child” for antebellum Illinois law, and that this topic probably wouldn’t get funded for research without Lincoln’s name attached. Gerry asked about the logistics of publishing such a large number of documents, given that thousands more were found than anyone had believed possible. The entire set of documents would fill 23(!) CD-ROMS. Luckily, DVD-ROM technology became available prior to their publishing effort and the 96,000+ documents fit on only 3 DVD-ROMS. Obviously, with the continued evolution of the internet, it has also become viable to produce the entire collection online. Stowell pointed out that the college generation and below are expecting more and more content free of charge on the internet. Illinois and foundations have provided most of the money for this project. The Lincoln Log web site (http://www.thelincolnlog.org) shows users what Lincoln wrote or had written to him on a given day. New information continues to be added as it is found, subject to verification of course. Stowell commented that some people, due to bias, location, or family heritage, could and would send in questionable material. Due to that tendency, sending in submissions is heavily regulated. The legal documents are actually pictures rather than documents, so you cannot fully, truly search the entire collection. With that said, they have gone through and created a database full of people, subjects, court cases, etc. which are searchable. Funding would not be available to truly transcribe everything, according to Stowell. In the late 1990s Stowell thought more about how the Lincoln Legal Papers were meant to “complete” the collected works of Abraham Lincoln. He also realized many items which had been found needed updating with more expansive annotation and many more items needed to be included. By 2001, the Illinois Historic Preservation Agency agreed to expand the project, making Series I the Legal Papers, Series II his papers up until becoming President, and Series III his Presidential papers. During research, Stowell’s group makes sure they thoroughly document every place they search and every document they find. Many times, even after explaining that they were ALSO looking for letters and documents sent TO Lincoln, Stowell and his colleagues do not always get what they were looking for. As a result, they place great importance on searching for items personally. The third segment started by covering how one would contact The Papers of Abraham Lincoln if they think they have found a new Lincoln document. If they have it in their possession, they can call, email, or fill out a form. If they suspect a document is in a local repository, they can check a list of repositories which have worked with them in the past. The Papers of Abraham Lincoln Project would simply like to get high quality images of these documents. Stowell mentioned that some people are more cooperative than others. He reiterated that if the document contains Lincoln’s handwriting or is addressed to Lincoln, they are interested. Period. Stowell recently took a trip to Hawaii to find Lincoln documents sent to two Kings of Hawaii while Lincoln was president. He also noted that oftentimes people do not know what they have in their collections. Last week’s show looks like it was lost to history (just like the George Skoch episode). The podcast was never put in the archives.